We all know the key to a comfortable retirement is amassing enough wealth to last your entire post-work life. But if you truly want to ensure financial security, you should work to maintain or even build upon your net worth as you age. This requires an aggressive level of saving when you are young, and a lot of discipline along the way — but it can be done. 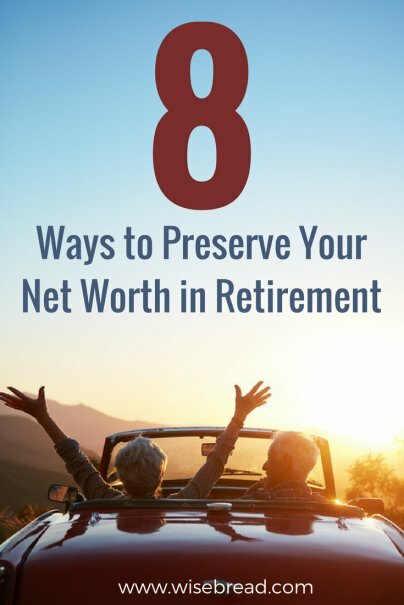 Let's examine some ways you cannot only make your retirement savings last, but also protect all of your net worth throughout your lifetime. Retirees generally see their expenses decline as they age. The kids are out of the house, college is paid off, homes are owned free and clear. Don't get too cocky, though; you still need to ensure your expenses don't outpace your income. Continue working hard to live within your means. Keep budgets for most expenses, and develop savings plans for any big-ticket purchases. If you want to maintain your net worth, you can't allow your day-to-day cost of living to get out of hand. Do you need to live in such a large house? Do you really need two cars? You can reduce your day-to-day expenses and make your retirement funds last longer by simply scaling down your possessions. Considering selling some of your material items and converting them to cash for living expenses or for investing. Or, just donate them to charity and potentially get a tax break on donations. In an ideal world, you are spending your retirement living off the gains and interest from your savings, not the savings itself. If you amass enough savings, that sum can by itself generate its own income in the form of interest, dividends, and capital gains, and it may be possible to live on that income alone. You need a lot of money saved to make this happen, but it's a wonderful feeling to know you are living comfortably without ever tapping into the bulk of your savings. You may be tempted in retirement to finally buy that beach house, that luxury car, or that set of his-and-hers personal watercraft. This is fine if these are things you saved for, but you can't let yourself go overboard. The last thing you want is to take on new debt that will add to your expenses at a time when your income is drastically reduced. It may seem counterintuitive to consider investing when you're looking to protect the income you have. But there is a growing body of evidence to suggest that it's OK to invest in stocks even as you get older. Why? Because people are living longer and are more likely to outlast their savings. Continuing to invest smartly in stocks can help you increase your savings and make it last longer. It's certainly wise to move most of your money into safer things like bonds and cash, but setting aside a certain portion for stocks could mean the difference between seeing your net worth shrink and watching it grow. Hopefully, you've used tax-advantaged accounts such as a 401(k) and Roth IRA to build your retirement savings. When you retire, you no longer have those vehicles at your disposal. But there are some things you can do to keep the government from taking too much. First, you can work to ensure that any income you have is taxed at as low a rate as possible. This means taking advantage of stock dividends and long-term capital gains, which are taxed at lower rates than normal income. It means purchasing tax-free municipal bonds. It means claiming as many deductions as you can on your taxes. Taxes are necessary to keep our society upright, but there's no reason to pay more than required. This is not an argument against helping out your children or other loved ones with financial expenses. But it's important to be thoughtful about how you help and the impact it may have on your finances. Is the money you are giving to your adult child simply throwing good money after bad?